throughout the academic year both on and off campus. The band performs regurlarly at Chicago's premier jazz club, Joe and Wayne Segal's Jazz Showcase. 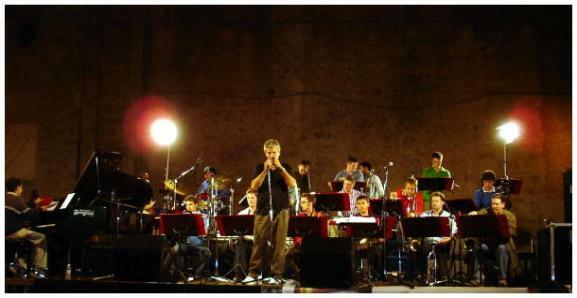 Festival, and a concert tour of Italy. students don't just play the parts. about. The solo is the jazz specialty and Bob has some of the best soloists around." wonderful arrangements. This live recording is a great example of how a jazz band should sound. My compliments to Bob Lark and the DePaul University Jazz Ensemble." really a ball! A fantastic program, a terrific band with many excellent soloists!" was wonderfully obvious right off the bat: this band swings...HARD! CD by Darrell Wyatt, Kavin Fort, Steve Thomas and Ian Torres." precision or sound well rehearsed; on the contrary, they do all that and more." Professor Bob Lark (a Master in his own right!)." 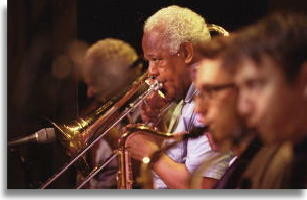 Ensemble with guest artist Slide Hampton.